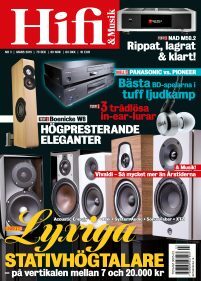 Hifi & Musik started out in 1970, and is still true to it’s roots: hi-fi and music! With hi-fi we mean everything you play music with, at home or on the go. Speakers of all kinds, is by far the most prominent product category in the magazine, whether it be floor standers, book shelfs, active monitors or design speakers. Equipment tests at Hifi & Musik is a two fold story, with intense listening sessions complemented with measurements, where we feel it necessary. We do in dept single product tests, duels and big group tests. Music is very important to us, with a music review section in the middle of the magazine, with sections of rock, electronica, world music, jazz, classical and hard rock. The review section is complemented with longer artist portraits and specials on seminal recordings. We are true to our roots and still today have turntables and vacuum tube amplifiers on test. The future of music reproduction, though, we see in the computer/NAS and streaming playback of music. Today we test more and more DAC:s, active speakers and network players as a result of this. Vimmerbys stolthet, TAD-emporietÂ Ultimate Sound & Music har fÃ¥tt ny hemsida och webshop."Ã„ntligen!" utbrister man pÃ¥ firman eftersom den fÃ¶rra kom fÃ¶r ganska precis 20 Ã¥r sedan. KlickaÂ HÃ„R fÃ¶r att lÃ¤sa PDF-filen av Anders Edenholms milstolpe om ursrpungsversionen av JBL L100, vars moderna uppfÃ¶ljare L100 Classic vi testar i nya Hifi & Musik nr 4/2019.